The Balwen belongs to the Welsh Hill and Mountain family of sheep, a group mostly made up of small, hardy landrace breeds that have largely remained unchanged for centuries. A small, slender sheep, the Balwen originated in a very small geographical area, the Twyi valley in south-western Wales, and evolved to survive on tough, sparse grazing and harsh conditions. As the native grasslands and deciduous forests were replaced with coniferous agroforestry, the Balwen lost much of its native habitat and the population steadily declined, until, after a particularly harsh winter in 1947, it is believed that only one male Balwen survived. Their existence today is due to the efforts of local farmers during the 1950’s and 60’s; the status of the Balwen is currently listed as “vulnerable” by the UK Rare Breeds Survival Trust. They do not appear to be found outside the UK. Balwen is Welsh for “white blaze” and refers to the white colouring on face, socks and tail on this breed. Body colour is black, dark grey or varying shades of brown; colour variation was useful to shepherds searching for their flocks. The fleece is short with wavy, often sun-bleached tips that give it a shaggy quality. Males have fairly large horns that curve towards the front, while females have no horns. Ewes usually lamb easily and make excellent mothers, having very few lambing problems and plenty of milk to feed their lambs. At their first lambing, most ewes have single lambs; from then on, under the right conditions, many have multiple births. More docile than other breeds from this family, they can become very tame, though they often require firm handling! They are agile and long-lived and and will jump and play even in old age. Balwen are primarily raised for their meat and, as a result, there is little documentation of standard fleece and fibre statistics. Fleeces seem to range from soft-to-medium to coarse (32-50 microns) and characteristically contain some kemp (thick, wavy fibres with a white, chalky appearance) and dark hairs which add interesting texture and colour. 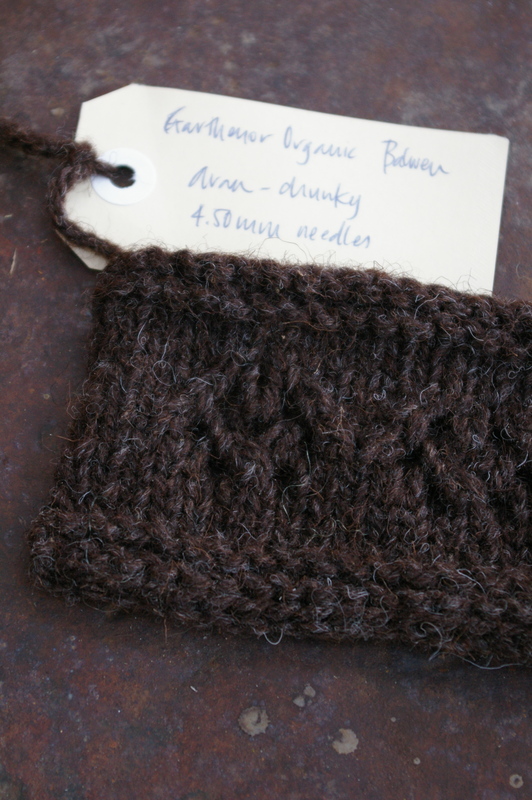 This sample is Garthenor Organic Balwen, a 3-ply, woollen-spun, aran-weight yarn and was knitted using 4.5mm needles. This yarn feels springy and firm, but not as scratchy as you’d think, looking at it! To me, it is softer than Deb suggests, with a broader application, so I wonder if the small range of samples available to her when reviewing it were of poorer quality than what was used for this yarn. It looks beautifully textured with great colour variation amongst individual fibres. It seems well-suited to hard-wearing outerwear, knitted or woven bags and thick gloves and slippers. If I had enough of this, I’d use it to make Willamette by Amy Christoffers. The simple, large-scale stitch pattern would work well with the springiness and woollen-spun quality of this yarn, while also allowing the texture and colour variation to really shine. It would make a beautiful, warm and snug jacket for winter walks. I really love Amy’s designs! This entry was posted in creatures, knitting and yarn and tagged amy christoffers, balwen, deb robson on August 8, 2012 by admin. White Blaze, so evocative. Don’t you just love Deb Robson? She is the absolute best. And so is Amy for that matter. 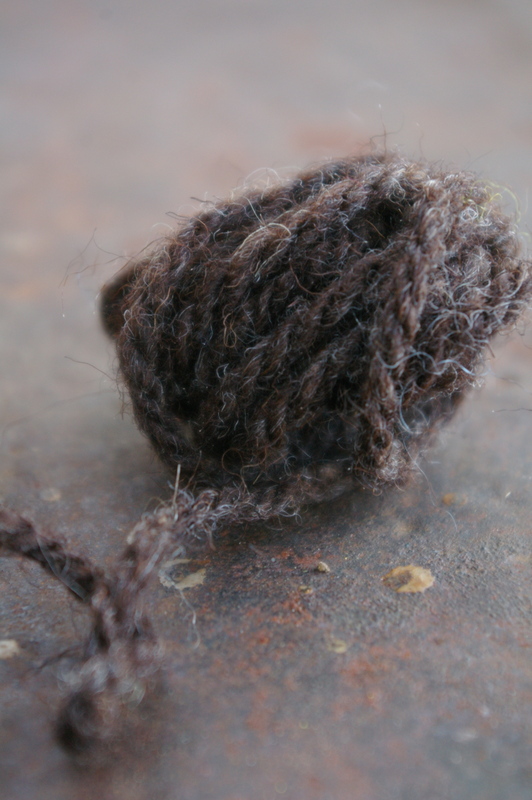 I love old-fashioned wooly wool like this. We see Balwen on a farm not so far from here, in NE Wales, but I know of farmers breeding Balwen in Devon, hundreds of miles south, so they’re longer confined to Wales, although they’re still very much a rare breed, as you say. Oh, you lucky thing, to be able to see them so close to home ; ) Thanks a lot for letting me know that they are expanding their territory! I think the Garthenor Balwen is a lovely yarn and well worth a try! Thanks for this post which is both interesting and very helpful. I’m thinking of buying some undyed Balwen yarn from the local farm where we buy our meat. http://southyeofarm.co.uk.